Once again, another outfit inspired by my jewelry of the day. 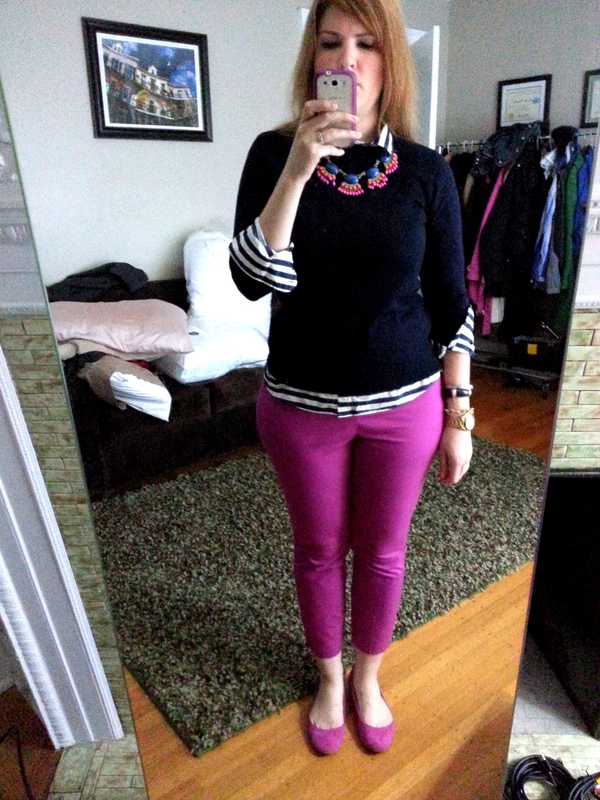 I’m a big fan of the bright dahlia colorway from J.Crew, and as you can see by my Ann Taylor Chelsea crop pants, they put out the same shade last year as well. It was another cool morning on Friday, hence the layering. This is the J.Crew lightweight boyshirt in stripe and it is a nice not too heavy piece for layering under the Tippi. My style is definitely more layering when it comes to button downs, mostly because no matter how much pinning/garment taping I do to my shirts, I usually end up gaping in them. So under sweaters it is. So, there you have it. A few days late…I’m really trying to stay on a regular posting schedule but the summer has been busy! Just wanted to say thanks for reading and leave me your comments below! That’s a really cute outfit. What about wearing a tank underneath and unbuttoning the top 3 buttons on casual days. I find that some of the buttons come undone so I’ve just accepted wearing a tank under and call it a look.